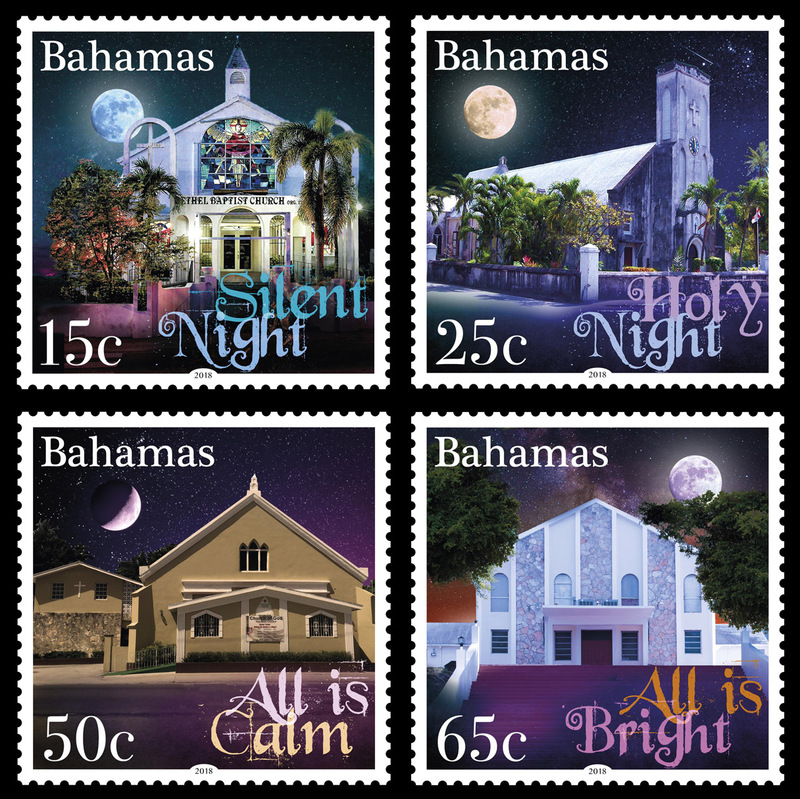 Four historic churches are spotlighted on the Bahamas Christmas 2018 stamps, issued by Pobjoy Mint. The four colourful stamps feature night-time images of the churches, with the stamps being tied together under the theme of the Christmas carol Silent Night, with words from the first line quoted across the stamp set. Williams, a carpenter, built the original wooden chapel named Bethel’s “Meeting House”. men, Bethel’s Meeting House was exceptional and pioneering. schoolhouse. Just seven years after the Emancipation Act of 1834 this singular move represented the church’s pastoral and evangelical response to the “New Bahamas” created by the Act. Centre-stage on a 50c value is Church of God, synonymous with the emergence of the Church of God movement in the Bahamas in 1909. Among the original converts and founding members of the church were Wilmore Eneas and his wife who experienced much persecution, including the destruction of their house by fire. These problems caused the founders to move first to Fox Hill and then to Bain Town before settling in 1919 at Eneas Jumper corner off East Street in a new wooden church. The church came to be known as Eneas Jumper Church; hence the street was named after the church. The church can trace its roots back to 1942 when Sister Haddassah Poitier, then a member of Grants town SDA Church, invited all of the children in the neighborhood to Friday evening vespers and Branch Sabbath School classes the following day. Close by another grants Town SDA member, Sister Evangeline Rolle also conducted classes in her home. Soon after the classes combined to form one large class of around 100 children. To order the stamps, visit Pobjoy Mint.